An ordinary strap hinge can be applied to a door or box cover in such a way that only one wing will show. Ordinarily the hinge opens as at A, and. on reversing it, the hinge will open to the limit as shown at B. 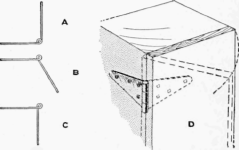 If one wing is bent toward the other, as shown at C, the hinge may be applied as shown at D. As this process reverses the hinge, the screw holes must be countersunk on the opposite side.